Mazak's SPACE GEAR-U 44 delivers the flexibility to perform (1) high-speed 2D processing of sheet metal and plate, (2) 3D cutting of pre-formed parts and (3) 3D-rotary cutting of tube, pipe and structural. It is ideally suited for fabrication job shops seeking to diversify their markets, parts suppliers supplying hydro-formed or stamped parts and machine shops that are now machining thick plates or tubing. In rotary mode, the SG-U 44 performs 2D and 3D cutting of tube, including rectangular, round, and triangular pipe as well as C, H, I and L-beams within a 6.0 inch diameter. The 5-axis torch and simultaneously controlled chuck let the SG-U 44 fabricate - in one operation - precise angle cuts, weld-prep bevels and advanced contours such as saddle joint cuts. The 64-bit control incorporates illustrated fill-in-the-blank screens to quickly program such complex contours and other cuts. 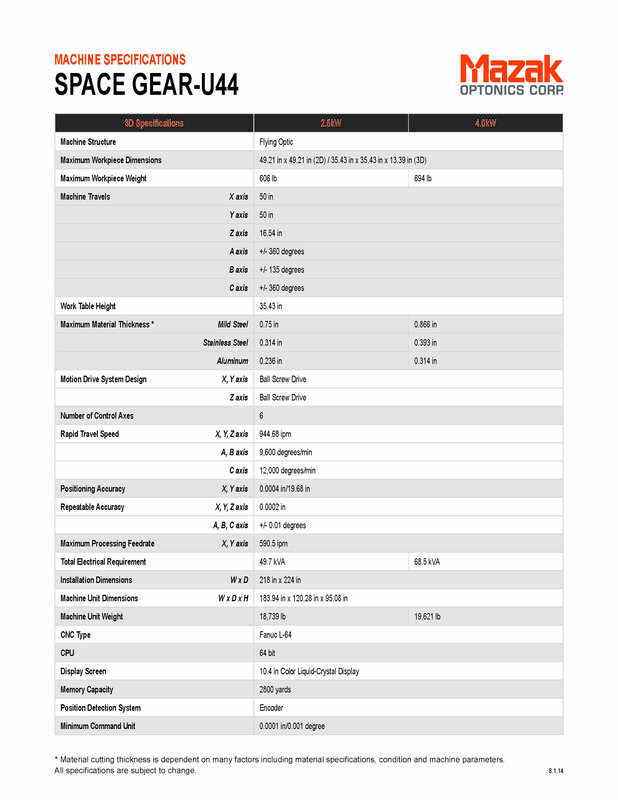 The SPACE GEAR-U 44 is a compact and affordable all-in-one 2D/3D laser center for maximum flexibility. Use its triple-mode, 6-axis capabilities to expand your shop's horizons and raise yourself above the competition. 2D mode is for flat sheet and plate cutting up to 49" square and a full .87". 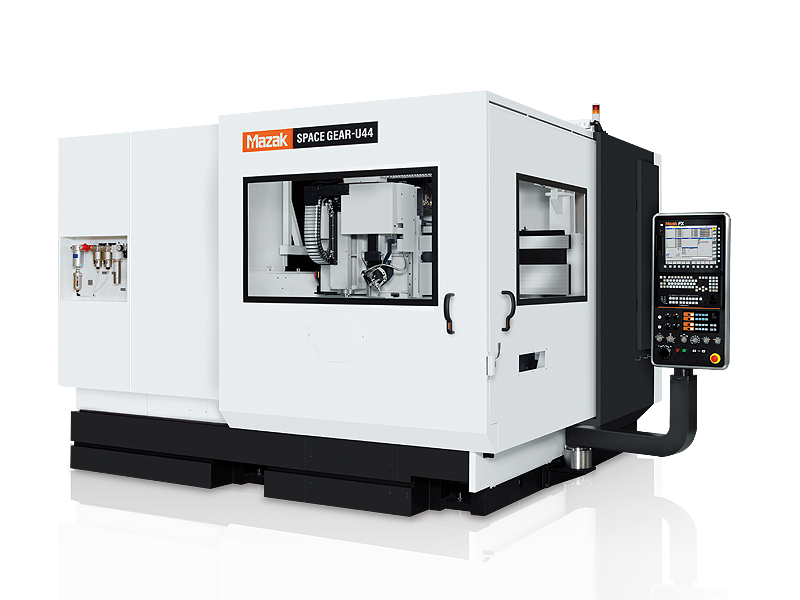 3D mode brings into play Mazak's compact cutting head with ±360º A-axis and ±135º B-axis CNC rotary motions to quickly cut, pierce, and trim sculpted parts. Process tubes, pipes, and structural shapes by adding a CNC rotary axis.